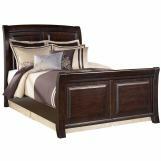 The Ridgley bedroom collection uses a rich finish and stylish details to create furniture that is sure to enhance any bedroom decor with an exciting contemporary design. 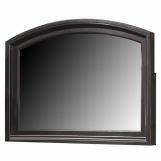 The dark brown finish flows smoothly over the deeply profiled details creating a stylish flair to this relaxed contemporary design that fits flawlessly into any home. With the beauty of the complementary satin nickel colored hardware, the Ridgley bedroom collection is the contemporary styled collection that you have been dreaming of. Enhance your bedroomâ€™s dÃ©cor with the exciting contemporary design of this sleigh bed. 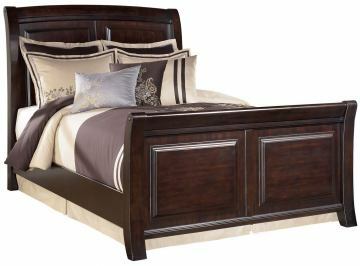 Queen, King or Cal King size bed features deeply profiled details creating stylish flair blending beautifully with the dark brown finish of the select veneer and hardwood solids. Awaken your bedroomâ€™s dÃ©cor with the exceptional beauty and style of this collection.